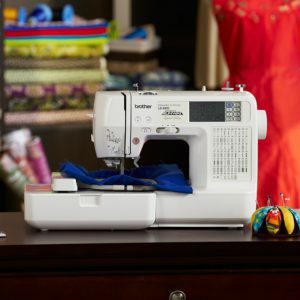 The Brother LB6800PRW Project Runway is a mid-range sewing and embroidery machine that costs between $300 and $400. 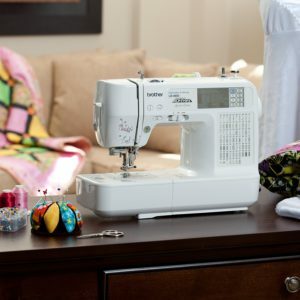 In spite of its affordable price tag, this particular model does come with a wide variety of features designed to enhance your sewing project and enable you to complete your entire project in no time at all. 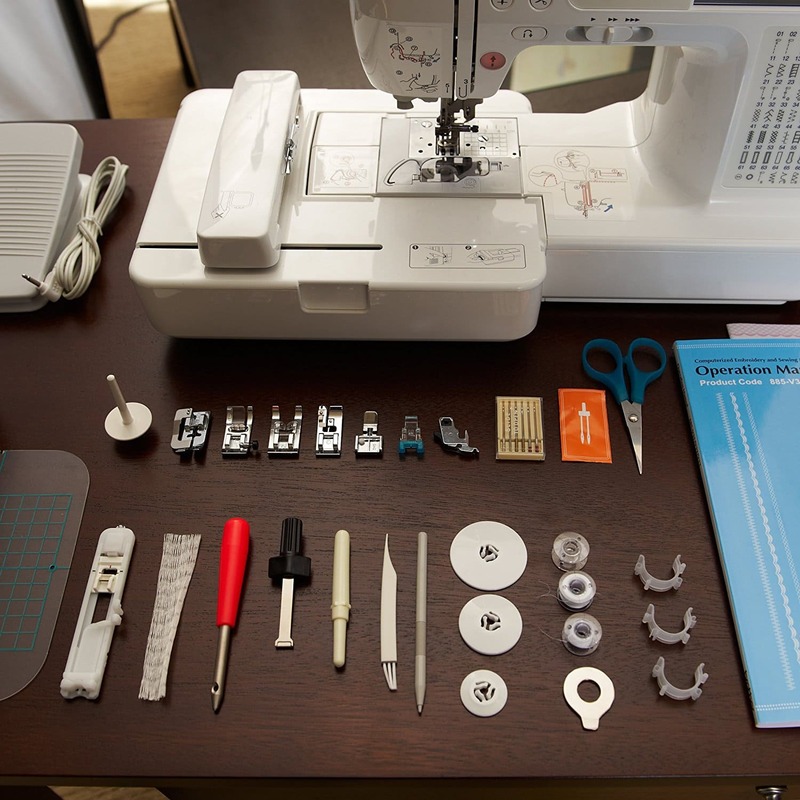 Thanks to being designed for both sewing and embroidery, this model is great for anyone that wants to indulge in embroidery projects but still don’t own a regular sewing machine. Compact and portable, the LB6800PRW can easily be carried back and forth to sewing class, which can’t be said of most embroidery machines, such as the Brother PE770 and the Singer 4-in-1. Because it’s so compact, the machine can even be set on just about any surface. Best of all, it comes with so many features that you can even use it to start your own home-based embroidery business. In fact, this particular piece of sewing equipment can be used with pillowcases, bedsheets, couch covers, curtains, towels and the likes. You can compare it with other models on our embroidery machine reviews. In spite of the wide range of features, there have been a few drawbacks reported with this product. While no major problem was reported, a few users thought that the light was not bright enough which made it difficult for them to operate the machine at night. Another issue that was reported by users was that the touchscreen, digital features were initially hard to operate, but this only affected novice users who didn’t have a lot of experience. The Brother LB6800PRW comes with a 4 x 4″ maximum embroidery area. While it is not overly large, the standard-size embroidery is still spacious enough to accommodate most of the embroidery designs you’ll find. Indeed, it’ll prove large enough to embellish or monogram your home accents such as towels and sheets as well as your clothes. The embroidery area can also accommodate different types of fabrics like satin, heavy denim, faux leather and the likes. Its size provides you with a comfortable work area that enables you to access your fabric from the optimal angle. Despite being a multi-function machine, the LB6800PRW is quite easy to use. Changing the machine from sewing to embroidery mode can be a bit of a hassle but it’s still not that complicated. Novice users can make the most out of the apparatus’ bilingual and fully illustrated instructions manual to help them find their way around the machine. Because of the apparatus’ LCD screen, you can very easily shuffle through the different functions: indeed, all users need to do is swipe their finger across the screen to select their embroidery design, adjust the tension and activate a variety of other features. On its sewing mode, the Project Runway is also designed to help you reach hard-to-access areas like hems, collars, cuffs and the likes. If you’ve never used an embroidery machine before, you will be glad to learn that it even comes with a built-in tutorial to provide you with insightful knowledge about embroidery. This tutorial includes various types of topics on how to properly position the spool thread or operate the automatic bobbin winder. 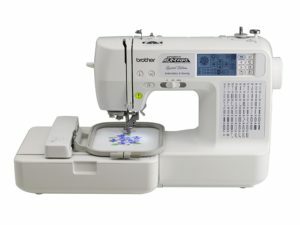 The machine provides you with easy computer connectivity thanks to its USB port, enabling you to import as many designs as you want from iBroidery or wherever else you want online. The machine comes with a unique rotating feature that enables you to view your project from different angles. This also includes a mirror-image feature to ensure that your project is pristine-perfect by the completion of your project. With the editing tool, users can reduce or enlarge the size of their selected embroidery design. They can also rotate the image, so they can view it from different angles or create a mirror image. All this can be done with the LCD screen, so you’ll get an idea of what your design will look like before you transfer it to your fabric. As far as embroidery is concerned, users will be able to enjoy over 70 built-in embroidery designs and of course, import as many as they want from their laptops. The built-in embroidery designs include, but are not limited to, quilt as well as floral patterns. With this apparatus, you can even benefit from five lettering fonts and 120 frame pattern combinations. When on sewing mode, users will also be able to enjoy of some variety, as the machine comes with 67 stitch designs and 10 buttonhole styles. Instead of a heavy carry-case, the machine comes with an appealing rolling bag which you can use to carry it just about anywhere you want to. The storage area even includes a wide number of free accessories destined to both sewing and embroidery. These include an embroidery hoop and arm, spare needles and a bilingual English/Spanish manual. Sewers also receive a plethora of accessory feet like button fitting, buttonhole, zipper, overcasting, embroidery and blind stitch foot. Easy to use, practical and- more importantly- budget friendly multi-function machine, the Brother LB6800PRW is a recommended buy to anyone who wants to indulge in both embroidery and sewing. Thanks to its extended range of features, users can be sure that they’ll receive a great value for the money.